Are you pregnant? From your first labour contraction to the birth announcement, BirthBerry is there to help! 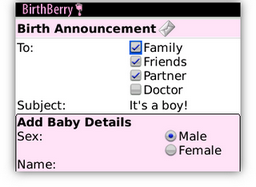 Track your contractions, notify friends and family, and announce the birth all from this BlackBerry® app. Touch any key to start timing your contractions. BirthBerry will keep track of them and automatically calculate the statistics you need to make an informed choice about when to call your doctor, or go to the hospital. False labor, no problem, just erase your history and start timing again. You can tell BirthBerry to automatically notify everyone from your doctor to your friends about different stages of your labor. Call your birth partner on the first contraction, email your family when your contractions progress, and page your doctor when you leave for the hospital. Use BirthBerry to record the vital stats about your newborn. Then let BirthBerry send a message to your family and friends on your behalf with all the details about your new addition. Attach a photo to the message to show everyone how beautiful your new child is. Simple contraction timing which allows you to start the contraction timer by clicking almost any button. Easy to read statistic screens with multiple display modes: Basic, Detailed, and Chart. Add notes and contraction strength ratings. Delete or edit each contraction entry from your Contraction History. Clear the history if you’d like to start fresh. Quickly record other related events such as vomiting, temperature, or water breaks. Automated event notifications – Setup event notifications in advance by adding contacts to your Doctor, Friends, Family and Partner lists. Choose conveniently preset parameters for when you’d like to notify each of them and for what type of event. Create a Birth Announcement message to send to all your previously specified contacts with easy to input baby details. Preview the message and send whenever you are ready. Add a photo to your message with a few easy clicks. Email your contraction history in multiple attachment formats (CSV or HTML).